+2 to one mental ability score: Kalashtar gain a +2 bonus to one mental ability score chosen at creation, to represent their powerful minds. Medium: Kalashtar are Medium creatures and have no bonuses or penalties due to their size. Normal Speed: Kalashtar have a base speed of 30 feet. Naturally Psionic: Kalashtar gain the Wild Talent feat as a bonus feat at 1st level. If a kalashtar takes levels in a psionic class, he instead gains the Psionic Talent feat. Psionic Aptitude: When a kalashtar takes a level in a favored class, he can choose to gain an additional power point instead of a hit point or skill point. Telepath (Ps): A kalashtar gains one discipline talent as a psion (telepath) of his character level. If he later takes levels in psion he must choose different discipline talents, but does not lose this ability. Pass for Human: Kalashtar receive Pass for Human as a bonus feat. 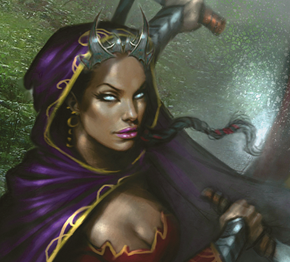 Unearthly Presence: Kalashtar receive a +2 bonus on Bluff, Diplomacy and Intimidate checks. Twin Soul: Kalashtar receive a +2 bonus on saving throws against possession and mind-affecting effects. Dreamless: Kalashtar do not dream when they sleep, and are immune to any effect which influences dreams. However, their natural recovery rate for mental ability damage is halved (i.e. a kalashtar would require two days to restore 1 point of lost Wisdom, rather than one). This does not hinder magical healing, such as restoration effects. Hatred: Kalashtar receive a +1 bonus on attack rolls against quori, Inspired and Riedran agents. This ability replaces Unearthly Presence. Path of Shadows: Kalashtar receive a +2 bonus on Acrobatics, Autohypnosis and Perform (dance) checks. This ability replaces Unearthly Presence. Quori Nightmare: The kalashtar gains a +2 bonus on Intimidate checks and can attempt to demoralise enemies as a move action. This ability replaces Unearthly Presence and Pass for Human. Racial Memory: Select one skill. That skill is a class skill for all of the kalashtar's classes. This ability replaces Twin Soul. Walled Mind: The kalashtar and his equipment cannot be identified as magical or psionic by divination spells or clairsentience powers. This ability replaces Telepath. Bard Add +1/2 on Perform (dance) checks and Acrobatics checks made to move through threatened squares. Binder Add a +1/2 bonus on binding checks and a +1/5 bonus on saves against possession and mind-affecting effects. Incarnate Add +1/4 to the incarnate's essentia pool. Monk Add +1/4 to the monk's ki pool. Oracle While psionically focused you gain a +1/3 bonus on checks made with the class skills granted by your mystery. Psion The psion increases the skill bonus provided by his psicrystal's personality by +1/2. Add +1 hit point to the psion's psicrystal. +1 Manifester level to Telepathy powers. Can add 1 additional telepath power to his powers known at each level he gains new powers. This does not count against his powers known. Psychic Warrior Add 1/2 of a power known from the psychic warrior power list. Ranger Add +1/3 dodge bonus to Armor Class against quori, Inspired, and Riedran agents. Rogue Add +1/2 on Sense Motive checks and on Disguise checks to appear as a human. Soulknife The soulknife gains one additional Blade Skill /6 lvls and gain a -2 to Required Level for Weapon Special Abilities. Wilder The wilder's risk of psychic enervation is reduced by -1% after all other modifiers (minimum 5%). Witch Hunter The witch hunter adds +1/2 to the number of uses per day of his Devoted Strike or Spellbane powers.